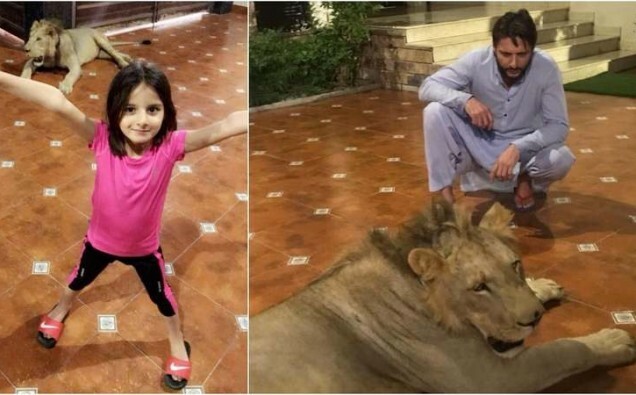 Conservator Taj Mohammad Shaikh of the Sindh Wildlife Department (SWD) has ordered an inquiry into the presence of a lion that was in the former Pakistani cricket captain Shahid Afridi’s home. If Shahid is found guilty, an appropriate action will take place against the former cricket player. Shahid was seen playing with an African lion inside his house, with his six-year-old daughter. They were both seen within reach of the carnivorous beast on the tiled floor with no barriers in between them. The lion was brought to the player’s house by one of his fans, Hassan Hussain, for recreation. The owner of the lion had said that he brought up the lion, now two years old, when its mother died after giving birth. He also stated that the lion was fully tamed and safe to be with. He also claimed that he was a fan of Afridi and took the lion to his house to show it to his children after obtaining a travel permit from the SWD. “The lion remained chained during the visit,” he said. Hassan said that the lion was not put in a cage and the animal remained seated next to him in his double-cabin pick up during the journey from his house to Afridi’s. Shahid Afridi’s manager Arsalan Haider Shah said the lion was tamed and there was no danger. He added that: “The lion remained chained for additional safety,” he added. Adnan Khan, an SWD official, said that Mr Hussain possessed a licence for a private mini zoo and kept the animals at his house which was located in PECHS and also had an animal breeding farm located in Mirpur Sakro. He added that it is risky to transport animals and special protocols had to be followed, particularly in case of carnivores. The SWD official said that even tamed animals were risky to handle. The sources were of the view that exposing children to such danger was questionable. They said that there were protective grills even in zoos in addition to the cages where the lions were kept. “There is usually a distance of five to six feet between the visitors and the iron bars of the lions’ cage to ensure the safety of the visitors,” he explained. When Afridi or Hassan asked what action the SWD could take, they found out that they could be warned or fined. “Suspension or revocation of Hassan’s licence is another possibility. In an extreme case, we can even confiscate the animal,” he concluded.